Tuberolachnus salignus apterae are mid-brown to dark brown with several rows of black sclerotic patches. The body is covered with numerous fine hairs (see first picture below), which give a greyish-golden sheen to the abdomen. There is a large dark brown tubercle in the centre of the back, just in front of the siphunculi which are on large dark cones. The antennae are less than half the body length. 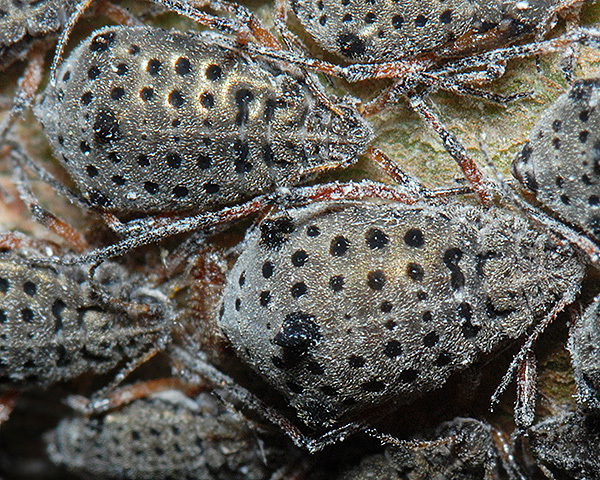 Tuberolachnus salignus are very large aphids with a body length of 5.0-5.8 mm. Unlike Lachnus aphids (to which it is closely related), Tuberolachnus salignus alates have the forewing membrane unpigmented. The pterostigma and costal margin are dark brown. Tuberolachnus salignus is anholocyclic, and no males have ever been found, so all reproduction is parthenogenetic. The females produce live young which are all genetically identical (clones). The species is strongly aggregative and can build up to very large colonies in late summer. 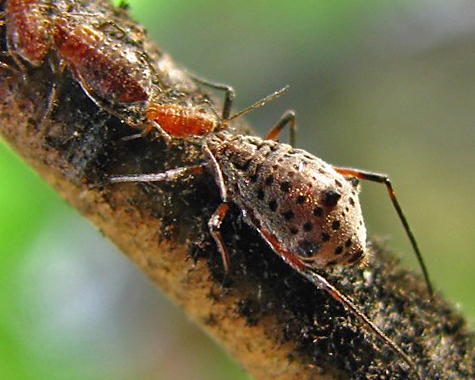 Density is the main factor affecting whether a nymph develops into an aptera or alate, although temperature may also have an effect. The function of the large dark brown tubercle on the back of the aphid is unknown (Heie, 2009). Hargreaves & Llewellyn (1978) showed that the degree of crowding also affects the number of young produced. The number of young nymphs produced reaches a maximum at moderate degrees of crowding, but declined in both uncrowded and densely crowded situations. 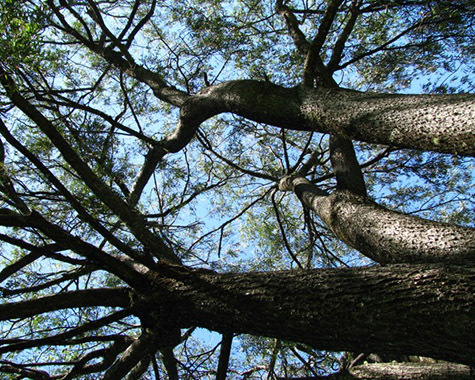 Collins (2001) notes the colonies can cover much of the 1-3 year old stem surface of a tree. One part of the giant willow aphid's life cycle remains shrouded in mystery. Tuberolachnus salignus have only been found on willow trees from July through to early March. Numbers tend to peak in October, but by February few are left on the trees and none has been seen from April to July. They are said to be very active in January and February when they often walk around off the host (Natural History Museum, 2011). Perhaps they hide in bark crevices before re-emerging in July to feed on willow. Large Tuberolachnus salignus colonies attract numerous honeydew-feeding insects. Colonies of nymphs with the founding alate(s) are usually ant attended. 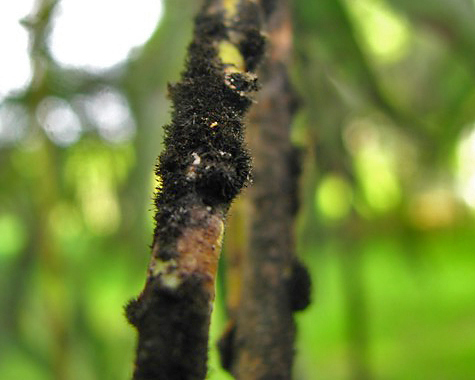 The two images above show jet black ants (Lasius fuliginosus) attending such colonies on white willow, the first record as far as we know of this ant species attending Tuberolachnus salignus. 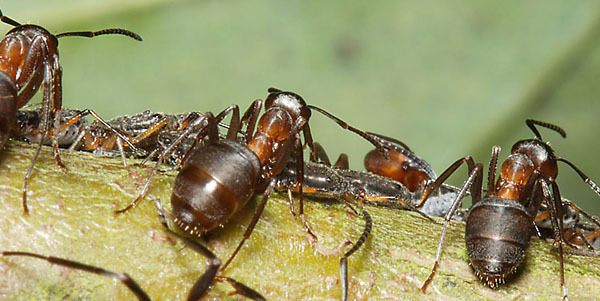 Southern wood ants (Formica rufa) also attend (and vigorously defend) colonies of nymphs with the founding alate. These pictures show ant-attended Tuberolachnus salignus colonies on sallow (Salix cinerea) rather than Willow. The alate has an unusually long post-reproductive life (Collins & Leather, 2001) and remains with her nymphs long after they have been born. 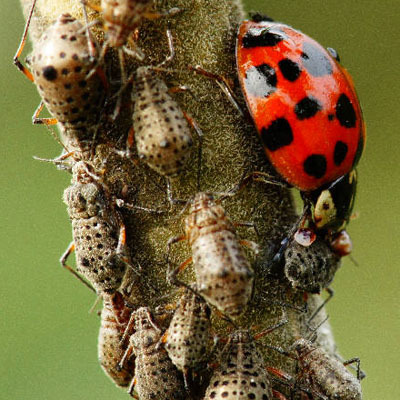 Dixon & Wratten (1971) have suggested that aggregative aphids benefit their clonal siblings by improving the nutritional qualities of the host through the 'sink effect' - which may explain the long post-reproductive life of Tuberolachnus. 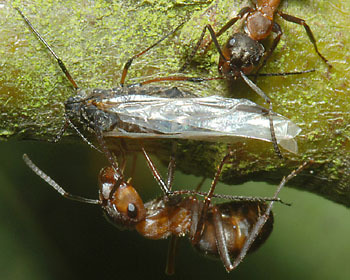 The image below shows several southern wood ants tending a large colony of giant willow aphid on Sallow in October. Despite the presence of large quantities of honeydew, colonies are not always ant attended. 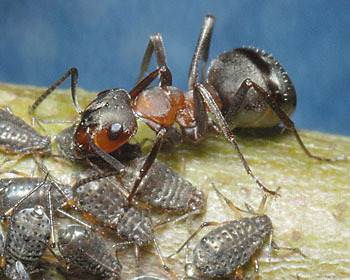 Collins (2011) reports that the aphids may actively repel ants. Many years ago, Buckton (1876) recorded the behaviour of aphids if there were no aphids to remove honeydew droplets. He reports that "if [the droplet] is not quickly withdrawn by an attendant ant ... it is projected by a peculiar jerk to a considerable distance". This ejected honeydew then attracts a different group of honeydew feeders. 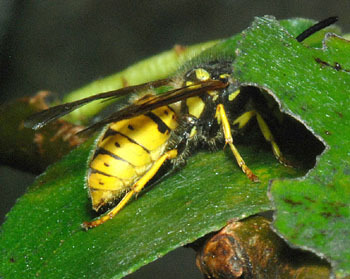 These two images show social wasps gleaning (collecting) the aphid honeydew from leaves beneath a Tuberolachnus salignus colony. 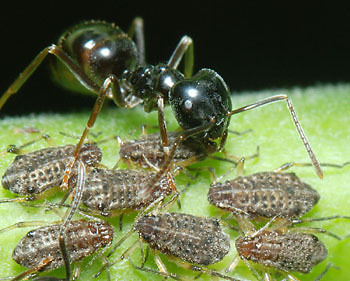 Unlike ants they do not collect the honeydew directly from the aphids. 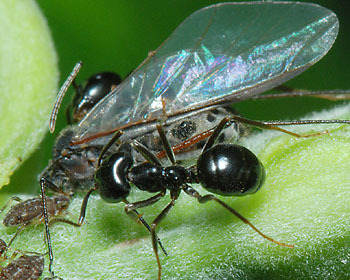 However, there is some evidence that they deter predators (Letourneau & Choe, 1978), which would make this a mutually beneficial relationship, much as that between ants and aphids. Certainly the swarm of wasps around some colonies would dissuade many mammals from approaching. Much like Lachnus species, they wave their hind legs in the air if disturbed by a predator. This behaviour may be synchronised over large areas of the colony. 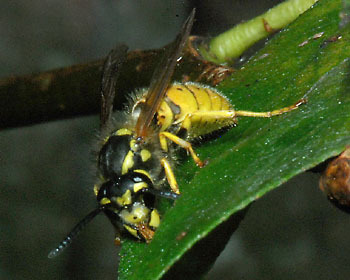 No parasitoid of the species has been recorded in Europe. 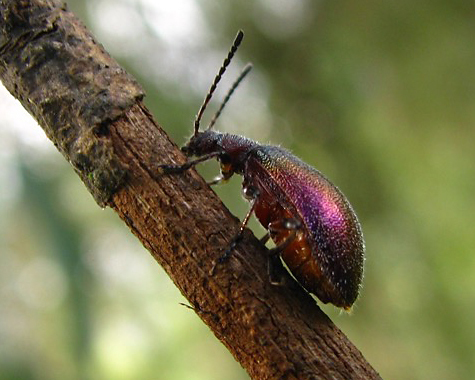 In Japan, Tuberolachnus salignus is parasitized by the braconid Aphidius salignae and by a specific hyperparasitoid Pauesia salignae, which might indicate that this is where it is endemic. Predators of this species are rarely recorded, not suprisingly because they appear to have aposematic colouration, perhaps to indicate they are distasteful. Hence our interest in the photograph below. Our thanks to Dr Wagner for submitting this. 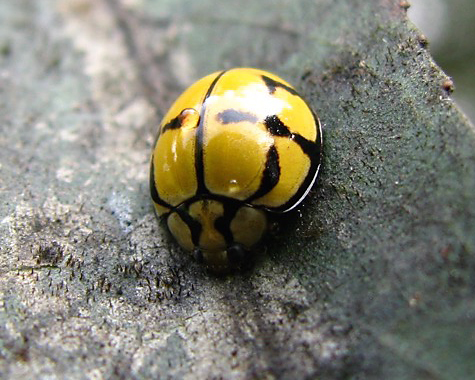 This is not the first report of Harlequin ladybirds predating giant willow aphids (see also Keith Edkins) so it seems likely that this predator at least finds Tuberolachnus salignus palatable. 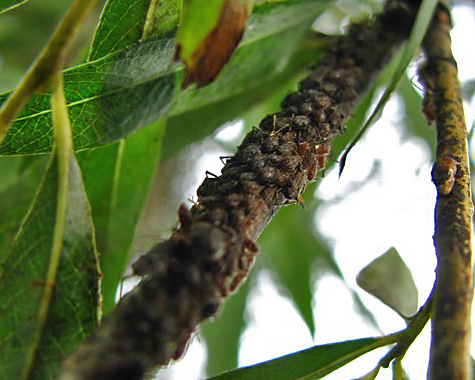 We have also received a report of predation of giant willow aphid from Michelle Smith in Australia. Tuberoachnus has only recently arrived in Australia, and the local predators in particular the netty ladybird beetle (Harmonia testudinaria) have been seen feasting on them. Tuberolachnus salignus is recorded from 53 of the 400 willow species, including white willow (Salix alba) and weeping willow (Salix babylonica). Blackman & Eastop list over 120 species of aphids as feeding on willows (Salix species) worldwide, and provides formal identification keys for aphids on Salix. Of the 41 aphid species Blackman & Eastop list as feeding on white willow (Salix alba) Baker (2015) lists 24 as occurring in Britain: Aphis farinosa, Aphis gossypii, Cavariella aegopodii, Cavariella aquatica, Cavariella archangelicae, Cavariella konoi, Cavariella pastinacae, Cavariella theobaldi, Chaitophorus capreae, Chaitophorus salicti, Chaitophorus salijaponicus niger, Chaitophorus truncatus, Chaitophorus vitellinae, Phylloxerina capreae, Phylloxerina salicis, Plocamaphis amerinae, Plocamaphis flocculosa ssp. brachysiphon, Pterocomma jacksoni, Pterocomma konoi, Pterocomma pilosum, Pterocomma rufipes, Pterocomma salicis, Stomaphis longirostris, and Tuberolachnus salignus. Of the 41 species on weeping willow (Salix babylonica), Baker (2015) lists 21 as occurring in Britain: Aphis aurantii, Aphis farinosa, Aphis gossypii, Cavariella aegopodii, Cavariella archangelicae, Cavariella aquatica, Cavariella konoi, Cavariella pastinacae, Cavariella theobaldi, Chaitophorus capreae, Chaitophorus horii ssp. beuthani, Chaitophorus populialbae, Chaitophorus salijaponicus niger, Chaitophorus truncatus, Chaitophorus vitellinae, Phylloxerina salicis, Pterocomma konoi, Pterocomma pilosum, Pterocomma rufipes, Pterocomma salicis, and Tuberolachnus salignus. 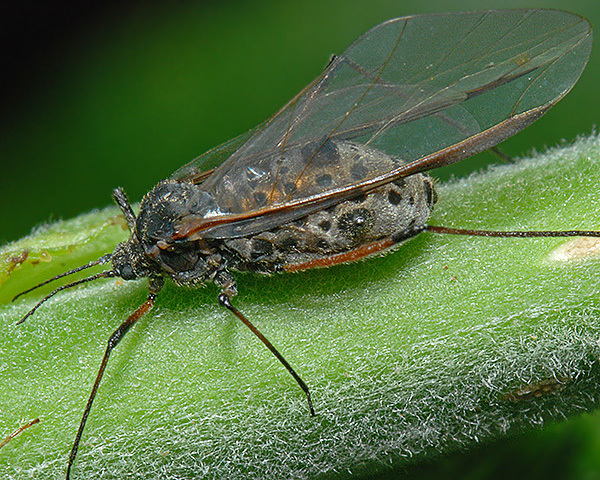 Tuberolachnus salignus has been found on 3 species of poplar: Populus alba (white poplar), Populus nigra (black poplar), and it is the only aphid known from Populus deltoides var. wislizeni (Rio Grande cottonwood). Of the 18 aphid species Blackman & Eastop list as feeding on white poplar (Populus alba) Baker (2015) lists 7 as occurring in Britain: Chaitophorus leucomelas, Chaitophorus populeti, Chaitophorus populialbae, Pachypappa warshavensis, Phloeomyzus passerinii, Pterocomma populeum, Stomaphis longirostris, and Tuberolachnus salignus. Of the 40 aphid species Blackman & Eastop list as feeding on black poplar (Lombardy poplar, Populus nigra) Baker (2015) lists 17 as occurring in Britain: Aulacorthum solani, Chaitophorus leucomelas, Chaitophorus populeti, Chaitophorus populialbae, Pemphigus bursarius, Pemphigus gairi, Pemphigus phenax, Pemphigus populi, Pemphigus populinigrae, Pemphigus protospirae, Phloeomyzus passerinii, Pterocomma populeum, Pterocomma tremulae, Stomaphis longirostris, Thecabius affinis, Thecabius lysimachiae, and Tuberolachnus salignus. Collins et al. (2001a) demonstrated that Tuberolachnus salignus markedly reduced the above and below ground growth of willow trees both during and after infestation. Infestations also reduced the survival of infested trees. This is serious problem where willow is being grown for fuel, and also for ornamental willow varieties. 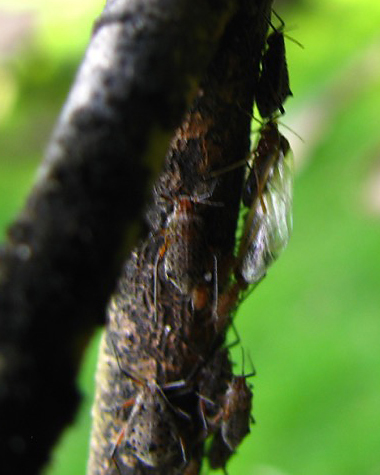 The most viable control strategy is to select willow varieties for pest resistance. Collins et al. (2001b) showed that reproduction rates of T. salignus differ between willow varieties and species. Aradottir (2009) has since demonstrated host preferences by olfactometry studies. These results were supported by subsequent field studies. We would like to specially thank Dr Wagner for the photo of Tuberolachnus salignus (Giant Willow Aphid) on Salix being predated by Harmonia axyridis (Harlequin Ladybird) in Gelnhausen, near Frankfurt on Main, Germany. I found your site trying to identify and control a large aphid colony on my willow tree. They have been coming around for about 4-5 years now and I am getting worried they are going to kill my willow. I live in Australia, in the northern part of NSW at around 700m where it gets cool in winter. They seem to start at the beginning of summer and I think die out heading into winter. I also find them congregating on a wooden bench underneath the willow. I desperately want to control these pests as they leave a sticky mess under the tree which coats everything. The tree is at my back door and is my pride and joy and I am starting to panic that they will kill it. I cannot identify which aphid it is so I have included some photos for your interest including some predators. There are other insects living amongst them which I have also included in case they are of interest. They are a brown color with three horn like structures on their bum. They come in all sizes and can get quite large. They seem to eject their 'piss'� which falls like rain and coats everything underneath. This sticky mess coats the leaves underneath and seems to be creating a mossy mould or fungus on the branches. There are winged ones and non winged ones. I'm not sure which species willow it is but it seems to me to be a regular weeping willow. I crush what I can reach almost daily in an attempt to control them, but they are always back in numbers by the next day so my attempts seem futile. Can you please offer any help as to how I can control them? I am organic and have even considered spraying them with pesticide! It is just a regular willow to my knowledge. Below is a Willow aphid. They come in various sizes, as do their colonies. Images copyright Michele Smith, all rights reserved. This is one having a baby. There are winged ones as well. This is a lady beetle larva eating an aphid. Notice the mess on the leaves, this one is actually not bad. Mossy growth on branches can get much thicker than this. These beetles are also around. 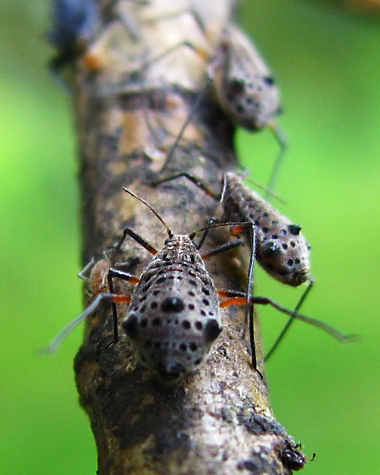 Your horned monsters are giant willow aphids Tuberolachnus salignus. They live on the stems and branches of many willow species. 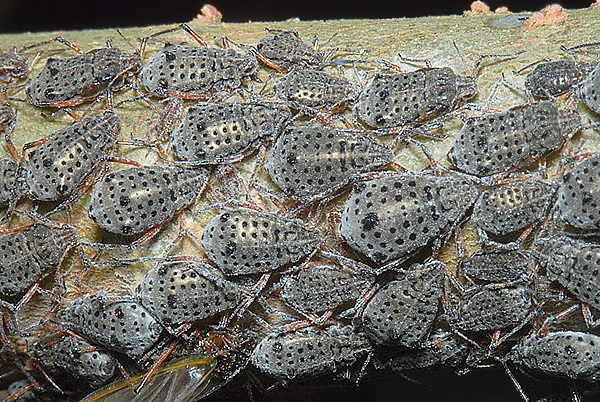 These aphids occur almost anywhere that willows are grown. But, although they are not the most common willow aphids they are among the more commonly noticed - at least by humans. When seen individually they look very striking, but en masse they are less visible to predators - most especially birds. 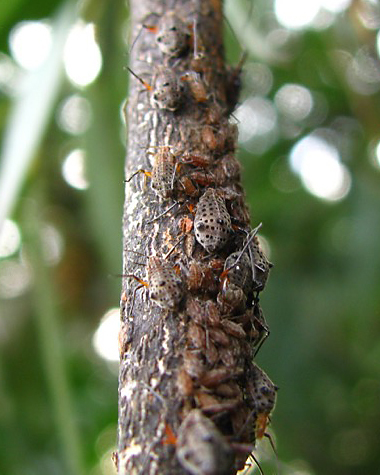 Giant willow aphids tend to prefer trees with old and broken branches, and other crevices, where they can hide from predators earlier in the year.That said, whilst these aphids may reduce tree growth, they seldom kill it. The interesting thing is that your aphid species appears to have only recently arrived in Australia, but we suspect that the aphid is probably now well established there. Tuberolachnus salignus was first recorded in New Zealand in 2014, and was found to already be widepread in the country. It was then surmised that the species had spread from Australia, albeit it had not at that time been reported from Australia. It has been reported from Tasmania. About the only sure way to get rid of these beasties is to remove the tree - which I assume you don't want to do. 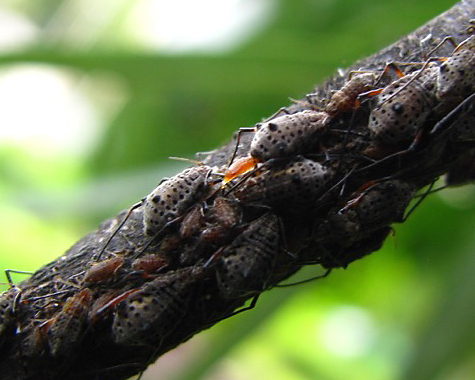 Insecticide treatment is relatively ineffective and expensive - and they will probably return. Classical 'biological control' of aphids (release of natural enemies) is usually only worthwhile in greenhouses. In a 'natural situation', aphid numbers are usually kept in check by predators and parasites, such as the ones you photographed - which is partly why infestations tend to burn themselves out. One way you, yourself, might reduce the problem is to encourage insectivorous birds - such as by placing feeders where the aphids aggregate. Note, since birds can take awhile to find new sources of food, you may have to put them out ahead of time. Or, if you are in a dry area, water may be nearly as attractive. If all else fails, you could simply accept you are host to a remarkable piece of natural biology - and invite your local naturalists round to partake of your spectacle. Our next-door neighbors had many amazing dinner parties showing off their nightly visiting wild badger - up-close and personal! You already have some fascinating predators feeding on the colony. 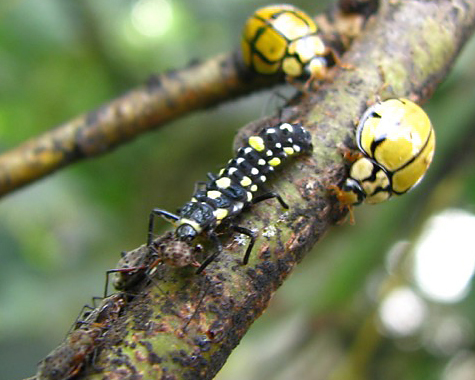 The yellow beetle is the Netty Ladybird Beetle (Harmonia testudinaria). Thank you for your very informative response. I will be sure to check out all the links you have referred me to. Although I am a bit upset that I may not ever be able to remove these pests I am surely going to give it a go. Yesterday we sprayed the tree with a mix of Eco-oil and Neem oil. It seems to have quietened the place down a bit at least for the moment? although I still had my usual crushing session. I plan to repeat this application if successful to try keep numbers down and will also concentrate on the knobbly lower bark (thanks to your email). I will let you know if I have success. It's good to get a different take on the subject and have a bit of compassion for the poor old aphid. After all, they may kill a few trees here and there, we on the other hand are wiping out forests by the truckload daily, who are we to criticise? I was just remembering that what made us notice the aphids (about 4-5 years ago), apart from the sticky mess that coated everything, was that the bees were in the tree humming away. At first we thought the tree was re-flowering or something? (its hard to tell with the weird climate these days) but I think they are after the honeydew? Also, about 10 years ago we got chooks, before that we had large populations of lady beetles and their lava, they covered the yard especially under the willow. Maybe the aphid was here all along and the lady beetle was keeping them in check? Being organic we always try not to use poisons or chemicals of any sort either in the house or out. We are using eco-oil out of desperation, but it is not supposed to hurt lady beetle, bees, earthworms or lacewings so should be alright. Neem oil is also a good one that targets aphids and is okay for organics, not to sure about the bees though. We do not want to hurt anybody unintentionally, I would just like to control the numbers a bit I suppose. This is my beautiful willow. Image copyright Michele Smith, all rights reserved. Don't know if this is of interest but, purely by chance, we have just finished writing something about the upsides and downsides of some of the invasive aphids in Europe.